Batch 4 includes Turkish officers, so here's some painting instructions for them sent to us by the Perrys. This information is taken from Chris Flaherty's Ottoman Imperial Army book and the Osprey title. 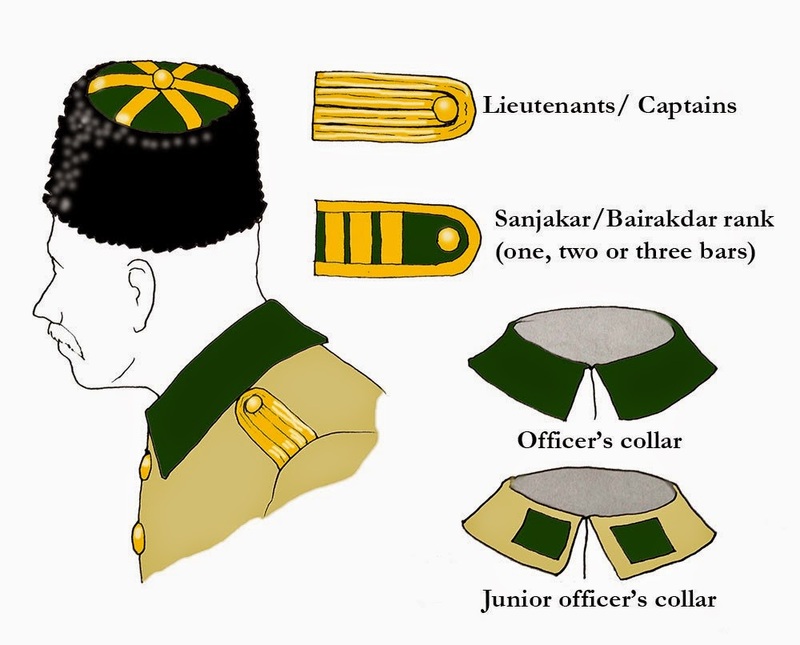 The tunics and trousers should mainly be in the various shades of the other ranks already painted, with ranks of lieutenant and above having all dark-green collars. It seems like shoulder boards were sometimes taken off in battle so could be filed off the model. It also seems as if the occasional officer could be painted in a white or dirty-white tunic with white collar, although officers wearing would be a bit of a target! If volunteers need more info have a look at the two books mentioned above, but bear in mind there won't be any high ranking officers present. There are also some British in this batch, who would be in various pale sand/stone shades (tunic and breeches should vary) like the Kiwis and with the same webbing/equipment. The above information will also be added shortly to the Painting Guides page.